For sheer pageantry and spectacle, few motion pictures can claim to equal the splendor of Cecil B. DeMille's 1956 remake of his epic The Ten Commandments. 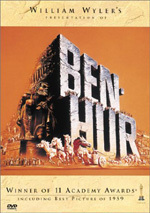 Filmed in Egypt and the Sinai with one of the biggest sets ever constructed, this version tells the story of the life of Moses, once favored in the Pharaoh's household, who turned his back on a privileged life to lead his people to freedom. Digitally restored to the original VistaVision splendor, with a new Dolby Digital track made from the original sound elements. Usually when a very long film hits the scene, we hear indications that theater owners feel unhappy because these epics reduce the potential number of screenings. If a flick runs 180 minutes, they can’t easily cram in two showings a night; either the first would start too early or the second would start too late. As such, they indicate their profits will decline due to the lowered number of showings. There’s only one problem with this rationale: many of the all-time most successful movies offered very long running times. Different lists show the biggest-grossing films adjusted for inflation, and although these charts don’t always agree, of the three I examined, six of the top 11 movies ever made ran 174 minutes or longer. Here’s their breakdown: Gone With the Wind: 234 minutes; The Sound Of Music: 174 minutes; The Ten Commandments: 220 minutes; Titanic: 194 minutes; Doctor Zhivago: 197 minutes; Ben-Hur: 212 minutes. Of the remaining five films, three of them - Star Wars, E.T. the Extra-Terrestrial, and Jaws - clocked in at around two hours, while the final two were the only genuinely short movies on the list. 1937’s Snow White and the Seven Dwarfs lasted 83 minutes, while 1967’s The Jungle Book ran 78 minutes. Admittedly, these kinds of hits are rarities, so I doubt this evidence will do much to change the minds of multiplex managers. There aren’t enough three-hour-plus movies to make any real generalizations about their success, and most of the flicks on this list are older “event” programs; Titanic was the only epic since the Sixties to reach the chart. Nonetheless, it does seem somewhat surprising to note how wrong the conventional wisdom can be. Hopefully the wild success of the Lord of the Rings flicks will also open some minds, though I expect they’ll also be viewed as aberrations. As noted, one of the biggest of the big was 1956’s The Ten Commandments. This Biblical epic is one of those flicks that you feel like you’ve seen even if you haven’t. Charlton Heston’s performance as Moses long ago became a cultural touchstone; for the last almost 50 years, it’s been nearly impossible to envision the character any way other than as Heston. Whether or not that is a good thing remains to be seen. Commandments attempts to relate the full story of Moses. In an unusual move, the film starts with an introduction from director/producer Cecil B. DeMille. He tells us a little of Moses’ literary history and sets us up for what we’ll see. It’s an awkward scene, but I’m sure it made the results seem all the more grand and impressive to Fifties audiences. After DeMille’s speech, we go back to Moses’ beginnings and see how the son of Jewish slaves became an Egyptian prince. Actually, we only witness his initial adoption by Bithia (Nina Foch), the daughter of the pharaoh, an action accompanied by some menace; servant Memnet (Judith Anderson) also sees this event, and though she promises never to reveal the baby’s ethnic origins, we can tell that she won’t be true to her word. Once this happens, we jump ahead a few decades and find Moses as a young man; his age is not related, but I’d assume he’s in his mid-twenties. This portion of the film sets up the main characters, especially as they relate to the competitive and antagonistic relationship between Moses and his brother Rameses (Yul Brynner). Both vie to inherit the pharaoh’s throne from aging ruler Seti (Cedric Hardwicke), and they also both want the love of Nefretiri (Anne Baxter), the woman who will marry the next pharaoh. Actually, that love triangle seems a little complicated. Rameses really lusts after Nefretiri, but she can’t stand him. Moses appears to like Nefretiri, but she’s the one who really pushes that side of the relationship. Moses simply looks as though he can take her or leave her. Through much of the film’s first half, we watch these relationships unfold, and Moses clearly takes the upper hand. His kinder, gentler administrative style helps create a new city to honor Seti, whereas Rameses’ abusive methods went nowhere. Seti declares that Moses will be the next pharaoh, but complications ensue and Moses’ true background becomes revealed. After lots of other issues, Moses eventually is banished and forced to cross a nasty desert. Against huge odds, he succeeds, and he then meets the family of Jethro (Eduard Franz). This shepherd has a wealth of cute daughters, but inevitably, Moses goes for the only one who doesn’t throw herself at him. That would be Sephora (Yvonne De Carlo), and the two eventually wed and bear children. Some years pass, and Moses finally confronts his true destiny as the deliverer of his people. He chats with God via a burning bush, and he then badgers Rameses - now the pharaoh - to free his people. Even though Rameses got the girl and the throne, he remains a stubborn jerk, and he refuses to listen to Moses, even when his former brother demonstrates the power of God. Only when the nastiest of plagues slaughters the first-born sons of Egypt does Rameses ultimately relent. The Israelites head out of Dodge, but not before they have to evade the vengeful Rameses and his troops. Moses evokes another miracle to allow them to cross the Red Sea, and from there, everything should become copasetic. Unfortunately, his followers are a capricious band. When he takes leave of them for 40 days to commune with God, they assume he either ditched them or died, and at the urging of pro-Egypt swindler Dathan (Edward G. Robinson), they start to party hearty. Unfortunately for them, Moses again yaks with God, who gives him the titular tablets. Once Moses returns with these documents, the festivities cease, and he punishes the non-believers severely for their trespasses. Ultimately, he waits until all of the fun-lovers have died until he leads their descendants into the Promised Land. That’s a lot of story, and The Ten Commandments is a lot of movie. 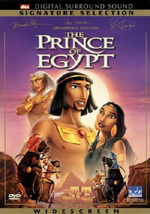 Frankly, it seemed like too much movie, largely because I became very familiar with the material via 1998’s animated hit The Prince Of Egypt. Since that 99-minute flick ran less than half as long as Commandments, one might assume that it must be inferior; logically, Commandments should be richer and truer to the source, and it should offer the more detailed and satisfying experience. Actually, I don’t think that was the case. To be certain, Commandments includes a fair amount of material that didn’t appear during Prince. We see nothing of Dathan or Nefretiri, and the animated piece also omits the story of Moses’ follower Joshua (John Derek) and his love for Lilia (Debra Paget). Prince also skims through all of the events that occurred after the parting of the Red Sea. However, Prince emphasized some aspects of the tale that received little attention during Commandments. We see much more of the interactions between Rameses and Moses, and they’re cast in a totally different light. I couldn’t claim to know which is more accurate, but I thought the intimate relationship that goes bad seen in Prince seems to be more resonant and rich. That version shows the pain and indecision felt by both parties, whereas Commandments is much more “old school”; we feel nothing but good from Moses and nothing but bad from Rameses, who is set up as an arrogant bully from the very start. Prince also better elaborates on Moses’ miracles and the plagues. Honestly, one of my main problems with Commandments is that it was inherently a romance. An inordinate amount of time follows the love triangle, and we also see a lot of the issues that confront Lilia and Joshua. Some attention to male/females relations isn’t out of place in this sort of film, but those aspects seem to overwhelm the meat of the story. It simply takes forever for Moses to learn the truth about his past, and even then, the movie doesn’t want to pursue that tale. More than two hours pass prior to the intermission, and these elements occupy the majority of that time. They appear excessive, and they badly slow the pace of the film. We all know where the story will go, and I became rather impatient to see it get there. Once Moses embarks on his spiritual journey, things began to move better, but we still see too much emphasis on dopey old Nefretiri. At best, she feels like a peripheral character, and once she eventually marries Rameses, she ceases to need to exist in the story. As proven by Prince, the role really is unnecessary, and the excessive attention to her relationships badly hampers the tale. Baxter’s weak acting doesn’t help. Many of the performances in Commandments seem hammy by modern standards, but Baxter really goes over the top. It’s difficult to watch any of her scenes and not laugh; she attacks her pieces with such unwarranted gusto and aggression that she makes silent film actors look subdued. None of the other performers stand out in such a negative way, but none really distinguish themselves either. As Moses, Heston displays his usual stiff work, but I can’t deny that he looks the part. Or the part looks him - after all these years, it’s tough to separate the two. Heston fails to deliver any subtlety or nuance in the role, but he gives Moses the appropriate presence, and I suppose that counts for something. Similar comments apply to Brynner’s wooden turn as Rameses. While I think the character should have shown some positives, I guess DeMille wanted Rameses to be a total villain, and Brynner delivers the goods in that regard. He makes the pharaoh totally hissable and worthy of one’s hate. Again, I feel the Prince Of Egypt approach is superior; the conflict between familial affection and duty to God really makes the relationship more complex and involving. Commandments’ Rameses is nothing more than a cartoon villain. At this point, The Ten Commandments seems appealing mainly as an example of theatrical camp. Actually, some of the scenes that show miracles could be fairly effective, though my affection for The Prince of Egypt taints those positives; anything good in Commandments is better in the animated flick. The latter is simply a much more taut, rich, subtle and involving piece. Commandments lays on the faux-grandeur and attempts to inspire awe too thickly, and I think it looks fairly silly much of the time. After I watched The Ten Commandments and wrote these comments, I checked out other opinions of the film. I don’t like to do this before I deliver my opinions, for I don’t want them to be affected by other viewpoints. Frankly, I was astonished to see so many positive feelings toward this movie. I felt it was slow-paced, poorly-acted and overwrought, but a lot of other clearly feel differently. To each his own, I suppose, but I did want to remark upon one area in which I simply cannot even moderately fathom the praise given to the film. Many folks thought that the movie offered fantastic production values, the likes of which modern films cannot rival. I hope that’s true, for I’d hate to see a recent flick that looked so bad. I won’t slam Commandments for its dated special effects. Actually, some of them still worked pretty well, though the different elements integrated poorly; Commandments used rear projection up the wazoo, and it always seemed terribly evident that two separate visual elements were at work. Since there was no way to stage the parting of the Red Sea in a practical manner, I can’t carp about the film’s attempts. However, I was startled to see how many “locations” actually featured the actors in the studio as they stood before a rear projection backdrop. Almost anytime we witness the performers in front of outdoor settings, these techniques appear to have been used. The sets themselves were badly unconvincing at times; for example, when baby Moses sailed down the river, it was patently clear that all of this took place on a soundstage. Many other instances of similar settings occurred throughout the movie. On one hand, I give The Ten Commandments credit for its attempts to stretch the effects capabilities of the era. However, it used different visual elements in an odd and unconvincing manner that did little other than take me out of the story. Ultimately, much of The Ten Commandments has not held up well over all these decades. 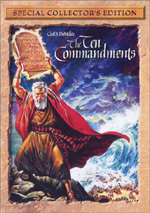 The Ten Commandments appears in an aspect ratio of approximately 1.78:1 on these single-sided, dual-layered DVDs; the image has been enhanced for 16X9 televisions. My attempts to give Commandments a letter grade were tough enough due to the age of the film, but these were exacerbated by the movie’s many effects shots. In addition to big set pieces like the parting of the Red Sea, much of Commandments used mattes and rear projection behind the actors. These elements clearly muddied the picture to a degree that wouldn’t have existed without such intervention. As such, I felt as though most of my concerns about Commandments’ image really dealt with its aged effects. Though the film exhibited fine sharpness during most scenes, quite a few others came across as soft and hazy. Some of these occurred during effects-free moments, but the majority of the fuzzy shots happened when the picture featured more than one element. At times those scenes could become rather nasty to watch; the effects have not aged especially well. Nonetheless, I found most of Commandments to appear rather crisp and detailed. The image also lacked moiré effects and jagged edges, and I witnessed no signs of edge enhancement. One might expect a film from 1956 to display some print flaws, and one would be correct. However, I thought Commandments provided a relatively clean presentation. Occasional examples of speckles, grit, streaks, blotches and scratches appeared throughout the film, but these were never overwhelming. I should note that many of these occurred due to the complex visual elements I mentioned; effects-heavy or rear projection scenes definitely displayed the most significant defects. The nature of he procedures utilized made these flaws unavoidable. Colors were a highlight of Commandments. The Technicolor production featured a very broad and lively palette, and the DVD rendered these hues with fine accuracy and vibrancy. Reds seemed to be especially brilliant and rich, and I also found greens to come across as quite fine; when we saw Jethro’s daughters dance for visitors, their outfits showed off the solid nature of the hues. Black levels also looked rather deep and dense, and shadow detail appeared quite natural. Low-light scenes provided appropriately dark but not excessively thick images; for example, the sequence in which Moses met his real mother showed some fairly fine delineation. Ultimately, The Ten Commandments presented a satisfying picture for its age, though the flaws inherent in its visual techniques rendered much of it more problematic than I’d like. Nonetheless, I felt pretty happy with the image. Due to the various concerns, I didn’t feel comfortable with a grade above a “B”, but I also thought the disc replicated the source material in a mostly satisfying way, and the movie occasionally looked quite glorious. More consistently satisfying was the Dolby Digital 5.1 soundtrack of The Ten Commandments. Most films of the era provided monaural sound, and even when they included multichannel mixes, the results usually seemed to be fairly uncompelling. However, I thought the soundtrack for Commandments was surprisingly rich and involving. The soundfield didn’t give us a great deal of variety, but it supported the movie to a good degree. Music offered the most involving aspect of the mix. Elmer Bernstein’s score showed very solid stereo separation, and the surrounds bolstered the music well. Effects were a more limited partner in the affair, though they added some depth to the proceedings. For most of the film, those elements seemed to be essentially monaural in nature, but large crowd sequences opened them up well. Basically, the bigger the scene, the stronger the environment, and the track became quite active during the movie’s showier pieces. The hailstorm plague was engrossing and active, and the romp through the Red Sea also demonstrated fine dimensionality and breadth to the track. The rears really came to life well during those sorts of sequences, and I even detected decent split-surround usage; for example, on occasion wind whipped from speaker to speaker. All told, the soundfield showed good life and activity, and it made much of the film livelier than I expected. Audio quality was also surprisingly fine. At times some speech demonstrated modest edginess; Brynner’s lines were usually the most affected. However, I felt that most of the dialogue sounded quite good, as Commandments offered speech that was generally warmer and more natural than I expect from the era. Music lacked tremendous range, but I thought the score came across as fairly well-defined and rich; at times the high end sounded a bit tinny and thin, but for a film of this era, the music was quite clear and vibrant. Effects also showed mainly positive attributes. They sounded clean and accurate throughout the film, and although they betrayed their age at times, I still found them to appear acceptably realistic and bold. Some distortion occasionally accompanied these elements - such as when the slaves raised the obelisk - but these occurrences happened very infrequently. A little background noise and hiss also marred the presentation at times, but these stayed modest for such an old movie. In the end, I was very happy with the soundtrack of The Ten Commandments. Although I grade audio on a curve, I don’t give “A”-level ratings to anything that doesn’t match up with modern efforts; I think the upper echelon should be reserved for material that is objectively positive. Because of that, The Ten Commandments will have to settle for a “B+”, but I must admit I was very tempted to grant the film a higher mark; this really was a fine soundtrack. When I compared this version of Commandments to the original from 1999, I discerned no differences. Both releases seemed to present identical picture and audio. That didn’t cause me any woes, though, as the old version fared well. The picture might benefit from a little clean-up, but overall, both image and audio remained quite satisfying, so the apparent lack of a new transfer was fine with me. While the prior DVD included only some ads, this new “Special Collector’s Edition” provides a mix of extras. Spreading across both discs, we find an audio commentary from Katherine Orrison, the author of Written in Stone: Making Cecil B. DeMille’s Epic, The Ten Commandments. Orrison gives us a running, screen-specific track. She doesn’t start to talk until a few minutes into the disc, as she only begins after the overture and DeMille’s introduction. However, once she launches into her chat, she rarely pauses. Orrison offers one of the best commentaries of this sort I’ve ever heard. She delves into virtually every aspect of the production. I couldn’t hope to address all the topics she mentions, but she tells us about elements such as casting – including actors considered for the parts – as well as DeMille’s style with the actors, their costumes, and other changes like the need for tinted contact lenses. Orrison chats about props, sets, locations, and the script. She gets into biographical notes for DeMille and other participants, and she lets us know many factors related to the story’s historical aspects. Lots of fun trivia bits – including goofs and continuity issues – appear as well as anecdotes from the set. Orrison demonstrates a consistently high level of energy, and she shows great enthusiasm for the film, which she clearly reveres. Although I don’t feel the same way about Commandments, that didn’t prevent me from truly enjoying this terrific commentary. The other extras fall exclusively on DVD Two. The six-part documentary runs 37 minutes and 36 seconds. This piece combines movie clips, some behind the scenes materials, and interviews with Cecil B. DeMille’s granddaughter Cecilia DeMille Presley, composer Elmer Bernstein, and actors Charlton Heston, Eugene Mazzola, Vicki Bakken, and Lisa Mitchell. We learn a little about casting, the shoot in Egypt, the effect of DeMille’s heart attack on the production, filming in Hollywood, this score, and DeMille’s working methods. We also get a lot of general anecdotes. After so much detail from Orrison’s commentary, there’s not all that much left to say in this documentary, and honestly, it doesn’t try very hard. The program remains quite general and fluffy overall, as it mostly talks about how wonderful the flick was and how big the production was. Some decent notes emerge along the way, but this doesn’t come across as a terribly satisfying program as a whole. Next we get a newsreel called “The Ten Commandments Premiere in New York”. This 143-second clip works like most of its ilk, as we watch notables arrive at the screening. Lastly, the trailers area presents three pieces, all from different eras. Most interesting was the original 1956 ad. At 10 minutes, this was probably the longest trailer I ever witnessed, and it was one of the oddest as well. Much of the clip showed DeMille; first he expanded upon the introduction that starts Commandments, and he also talked about the flick as we saw shots from it. The other two trailers were more pedestrian. One came from a 1966 reissue, and at 60 seconds in length, it offered much less information. Lastly, we get a trailer from the 1989 reissue. This 100-second snippet mainly touted the wonders of big-screen viewings, and it also promoted the newly-remastered six-track audio. In the “good idea” category, the DVD’s video extras include subtitles in English and French. In the “bad idea” category, we need to include the DVD’s case. It forces the discs to overlap – one on top of the other – and create a “figure eight” pattern. I’ve seen a few cases that put one disc on the other; both Yesspeak and the Limited Edition of Monty Python and the Holy Grail both packed their DVDs in such a way. This is even spreading to other formats; the new two-CD George Harrison Live in Japan release puts one disc directly under the other. It’s cheap and awkward and creates a lot of potential for disc damage. The package for Commandments seems even worse than the others; at least in my case, the spindle doesn’t hold the discs well at all, and they constantly slip free from their bonds without much provocation. I hope Paramount and other studios will return to tried-and-true 2-disc cases, but I fear that these crummy new ones will soon become more prominent. After almost 50 years, The Ten Commandments remains the best-known cinematic representation of Moses. However, I don’t think it’s the best, and the film hasn’t held up terribly well over the years. From hammy acting to cheesy sets to silly dialogue, Commandments suffers from the overblown pomposity that commonly affected epics. However, I must acknowledge that the movie receives a good treatment on DVD. The disc offers very solid picture and sound, and it also presents a roster of extras highlighted by a simply splendid audio commentary. Fans of the movie should be very pleased with this DVD, but if you’re new to it and just want an interesting Biblical effort, I’d recommend The Prince Of Egypt instead; that animated flick provides a much more compelling and moving look at the life of Moses. As for fans who already own the prior DVD, whether it merits an upgrade depends on their appreciation of extras. Both this set and the old one displayed picture and sound that seemed identical to me. Most of the new package’s extras didn’t impress me, but I really liked that audio commentary. If you enjoy that form of supplement, this DVD should be worth the bucks. Those partisans who don’t own the old release definitely should pick this one, as it represents the best DVD version of Ten Commandments on the market.